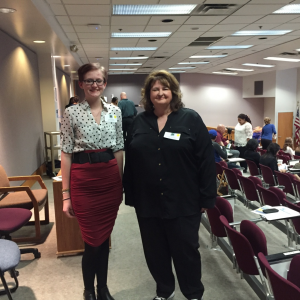 Alison Oliphant and Tanya Gabrielson at the National Center for Women & Information Technology Award ceremony. The National Center for Women & Information Technology (NCWIT) Award for Aspirations in Computing honors high school women who are active and interested in computing and technology. This year Idaho Digital Learning is honored to have one of our outstanding students win this prestigious award. Congratulations to Alison Oliphant. Alison has always had a knack for technology, can figure out new electronic devices quickly and find all the little fun tricks that go with it. She took an Introduction to Java class online through Idaho Digital Learning this last spring and used the skills she learned to program some physics equations into code over the summer. Alison is currently taking an AP Computer Science class online through Idaho Digital Learning and plans to take the AP test in May. Over the summer, Alison was chosen to be a part of the Idaho Science and Aerospace Scholar Academy and because of this was able to see some computer science first hand. As one of the eighty-eight students that were a part of the Idaho Science and Aerospace Scholar Academy, Alison was able to visit NASA Ames Research Center in California for a few days. Those few days at NASA were probably some of her best days in her life. Alison is currently planning on attending Boise State University and getting her dual major in Computer Science and Mathematics starting in the fall of 2016. In addition to identifying a pool of talented young women, the Aspirations Award also identifies outstanding educators who play a pivotal role in helping to encourage young women to continue exploring their interest in computing and technology. Tanya Gabrielson, Idaho Digital Learning teacher, received this award in 2014. Tanya was Allison’s AP Computer Science teacher and nominated her for this year’s award. “I think that she really is the “poster student” for the Computer Science pathway,” says Tonya on why she nominated Allison for this award. As an Affiliate Award winner, Allison received recognition at an award event, an engraved award, scholarship and internship opportunities, access to a peer network of technical young women in the NCWIT Aspirations in Computing Community and various other prizes — computing resources, gadgets, sponsor-branded swag, and more. Idaho Digital Learning is very proud of Alison and honored that she is one of our students.